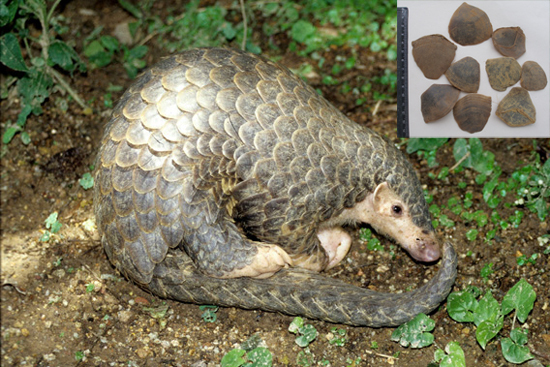 Part Used & Method for Pharmaceutical Preparations: The anteater scales are removed, cleaned and dried in the sun. Properties & Taste: Salty and slightly cold. Functions: 1. To invigorate blood and promote menstruation; 2. To promote lactation; 3. To reduce swelling and dispel pus. 1. Amenorrhea caused by blood stagnation. Pangolin scales (Chuanshanjia) is used with Chinese angelica root (Danggui), Chuanxiong rhizome (Chuanxiong) and Safflower (Honghua). 2. Postpartum insufficient lactation. Pangolin scales (Chuanshanjia) is used with Vaccaria seed (Wangbuliuxing), Ricepaper pith (Tongcao) and Chinese angelica root (Danggui). 3. Beginning of carbuncles and swelling manifested as red, hot, painful swollen skin. Pangolin scales (Chuanshanjia) is used with Honeylocust thorn (Zaojiaoci), Tendrilled fritillary bulb (Chuanbeimu), Frankincense (Ruxiang), Myrrh (Moyao), Red peony (Chishao) and Honeysuckle flower (Jinyinhua). 4. Wind-damp obstruction syndrome manifested as joint pain and motor impairment. Pangolin scales (Chuanshanjia) is used with Chuanxiong rhizome (Chuanxiong), Notopterygium root (Qianghuo), Pubescent angelica root (Duhuo) and Ledebouriella (Fangfeng). Dosage: 3-10 g decocted, or ground into powder for an oral dose, 1–1.5 g each time. Cautions & Contraindications: Pangolin scales (Chuanshanjia) should be used cautiously in sores that have already ulcerated. This substance is contraindicated during pregnancy.